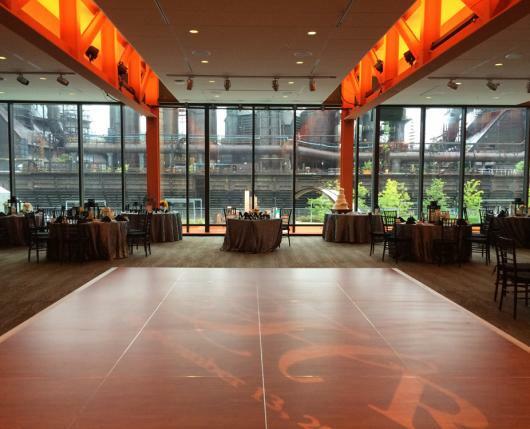 Breathe new life into your next business meeting, corporate event, social reception, or any other special function at the ArtsQuest™ Center at SteelStacks™! 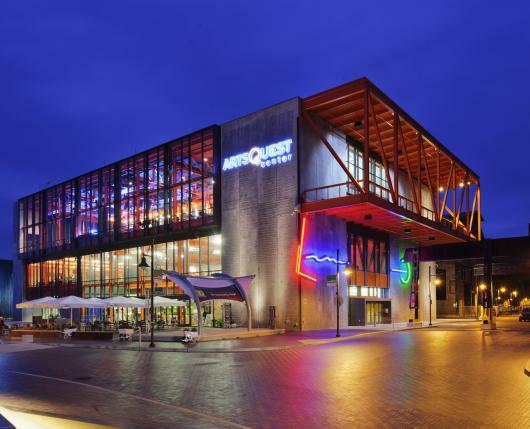 Facing the historic Bethlehem Steel blast furnaces, the ArtsQuest Center allows for events of all sizes. 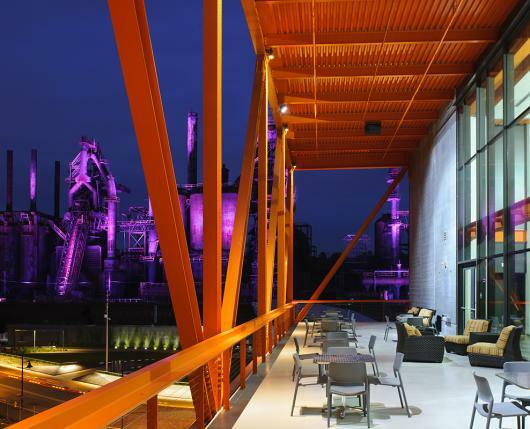 With floor to ceiling windows, an awe-inspiring view of the blast furnaces and a modern design, the past and present converge in this multi-purpose arts and cultural center in the heart of Bethlehem. The facility offers over 16,000 square feet of meeting space and accommodates large and small corporate meetings, seminars, trade shows, weddings, and special events. 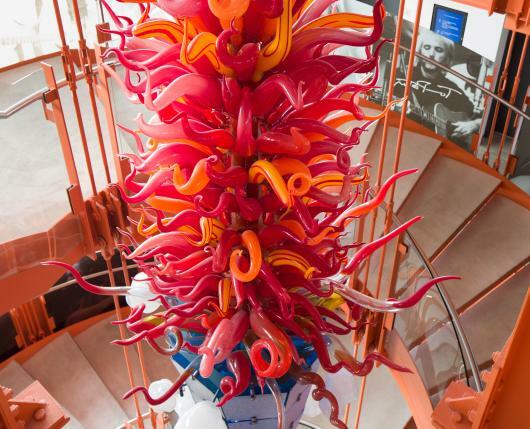 The Capital BlueCross Creativity Commons, located on the first floor, offers just over 3,500 square feet of space and is perfect for banquets of 150 people or receptions up to 220. The Lee & Stella Yee Connect Zone, also located on the first floor, is a smaller, intimate space that is perfect for a presentation for up to 100 people and is fully equipped with audio visual needs. In the Blast Furnace Room & Loft, you’ll find options within just over 4,000 square feet to host a reception and sit down dinner up to 200 people. Or, if you need space for up to 350 people theater style, this is the room for you. The room is adorned with floor-to-ceiling window views of the blast furnaces. Musikfest Café is the largest of spaces in the building and it is comprised of two levels. The first level will accommodate groups of 200 to 500+ people. The second loft-style level will host an additional 120 people in a banquet set up. This room also offers spectacular views of the blast furnaces. It also has several built-in bars which are easily accessible for your guests. 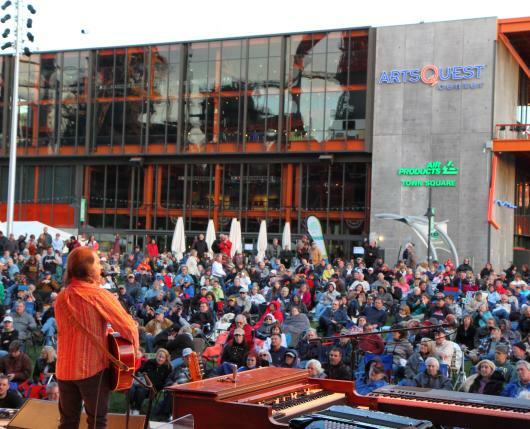 Professional staging and audio visual needs can be managed by the staff of ArtsQuest. You may also rent the Sands Deck which will surely please your guests during the warmer months of the year. In addition to the views, up to 60 people will be delighted with the stand-up reception or al fresco dinner options available here. The onsite hospitality staff will assist in planning your event. From brunches to exquisite entrees, the catering team provides a variety of options for you and your guests. This venue has completely up-to-date facilities with Wi-Fi internet access and state of the art audio-visual capabilities. Parking is available for free at the numerous lots on First St.